Future Scholars maintains a smoke-free environment. We ask that you do not smoke in the Center or on Future Scholars property. We are sorry for any inconvenience. 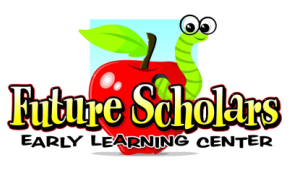 Future Scholars accepts all children on a first-come, first-served basis. Future Scholars does not discriminate on the basis of race, gender, religion, or national origin. Information pertaining to a child is kept confidential at all times. Records may occasionally be reviewed by regulatory agencies. Student files are otherwise kept confidential and are only monitored by the administrative staff. If your child is involved in an incident with another child, Future Scholars will not reveal the other child’s identity without written permission from the other child’s parent or guardian. According to the US Department of Health & Human Services, the "Medical Home" is a concept defined as the center of a child's medical records. The Medical Home is a cultivated partnership between the patient, family, and primary provider in cooperation with specialists and support from the community. A Medical Home is an important mechanism for uniting the many segments of a chid's care, including behavioral and oral health. At Future Scholars we recognize the importance of the Medical Home concept and aim to ensure that each of our students has a Medical Home as a way to ensure that they receive the proper medical attention they need. In keeping with this policy, and due to state regulations, Future Scholars requires each student to have a completed Universal Health Record on file, proof of vaccine history, and evidence of a flu shot received each year for students aged 6-59 months. We also ask parents to provide us with updated health care information including your child's primary doctor, dentist, and health insurance information. Children over 2 years old will be given instruction in our computer lab for approximately 30 minutes per week. Children under 2 years old will not be given screen time or computer use. Television and videos will occasionally be used for planned events, i.e. Movie Day and Parent’s Night Out. We will not use movies or television as a substitute for educational activities. All television, computer use and videos will be age appropriate. Fresh air and outdoor play contributes to your child’s health and overall development. Please make sure your child(ren) have weather appropriate clothing such as mittens, hats, coats and boots. In extreme inclement weather (rain, snow, icy conditions, extreme cold or heat) the children will be kept indoors. At Future Scholars our staff uses positive discipline as a process of teaching children how to behave appropriately. Positive discipline respects the rights of a child, the group, and the adult. Positive discipline is different from punishment. Punishment tells children what they should not do. Positive discipline tells children what they should do. Punishment teaches fear. Positive discipline teaches self-esteem. For more information on positive discipline, see our Guidelines for Positive Discipline. We encourage you to send your child to school on all of their scheduled days, except in the case of illness. Consistent attendance is important to your child's early education and will help ensure that they fain the most from our program.--helping tour child meet their educational goals and develop attendance habits that will carry on throughout their school years. Supporting a child's daily attendance allows parents to convey a message to their child that they value education and that school is an important priority. If your child will not be in school, please notify the staff as soon as possible. For safety's sake, if a student is absent without notification, a member of staff will attempt to contact the family to verify the student's absence from school. If your child will not be attending school, please call us at 609-518-1333 with the reason for absence no later than 9:30AM. Future Scholars Early Learning Center is responsive to serving culturally and linguistically diverse populations to ensure a high quality program for all children and families, including those whose home language is one other than English. We are supportive of other languages through labeling of classroom centers and by providing access to classroom materials in the home language when necessary. Picture labels are used around the classroom and basic sign language is utilized to aid in any language barrier. Future Scholars provides families with a Community Resource Guide available in our Parent Resource Center located in our lobby near the Parent Coffee Station. This guide includes community programs, agencies, and services available to aide in proper health, safety, and stability. We believe that regular communication with parents is essential to maintaining high quality of care. Our staff is better able to meet the needs of each individual child if parents provide relevant information about important happenings at home, updates on the child's health, and information regarding other matters of particular interest to the child. Likewise, our staff will communicate with parents daily about the events of the day and any important information specific to the child. Parents are encouraged to discuss any issues or problems concerning their child with the child's teacher or with a member of management. Any information given to the center will be treated in confidence. Encourage participation of all families and members of the community in the activities of the center and in the development of our programs, policies, etc. Promote effective communication between management, educators, families, children, and all those that are associated with the center. We strive to meet the above goals through formal methods of communication, including, but not limited to: monthly events calendar in our Parents' Center (located across from the front desk), printed and digital monthly events calendars and other information available at the front desk, classroom-wide daily reports for each child, child progress reports (three times per year), frequent website and Facebook page updates, annual Back to School Night and other special events where parents are invited to attend, opportunities for parent workshops and meetings, and parent/teacher conferences as needed. Toilet training is a growth period and progression of independence. All efforts made by the child will be acknowledged with praise and encouragement. Future Scholars has child-size toilets to help children during this development phase. When using the bathroom, children will be supervised and assisted as needed. Children will be taught to flush the toilet and wash hands with soap and water. In the event of an accident, soiled clothing will be placed in a plastic bag, sealed, and returned to the parents at the end of the day. When possible, we will launder the soiled clothing before returning them to you. We encourage parents to communicate with the Center Director and staff so we can work together as your child strives for independence. We will make every effort to follow your direction to ensure consistency between the Center and home. We implement the award-winning, nationally recognized, Creative Curriculum. Creative Curriculum is a play-based curriculum where teachers set the stage for learning, while children interact with and learn in various interest areas, including Blocks, Dramatic Play, Manipulatives, Science & Discovery, Music, and Art. We focus on using exploration and discovery as a way of learning, enabling children to develop confidence, creativity, and critical thinking skills. Every child learns differently, so our teachers are constantly observing their students in order to provide individualized instruction to each child. In addition to the Creative Curriculum, we implement Handwriting Without Tears program to strengthen fine motor skills and develop pre-printing and printing skills, as well as letter and number recognition. Teachers observe and document each child's progress and assess the children using the Teaching Strategies GOLD Assessment Tool. Assessments will be provided to parents three times per year. All students will be screened within 45 days of enrollment using the ASQ-3 developmental screening tool (Ages & Stages Questionnaire). Students will be re-screened if necessary. Information will be shared with the parents and Future Scholars will help families connect with local school districts if you are in need of additional services. Future Scholars will support parents by sharing behavioral plans with the school districts upon completion of our pre-k and kindergarten programs. Families are provided health and safety workshops and/or resources annually in topics that include preventative health, mental/behavioral health, nutrition, medication administration policies and procedures, oral health practices, and communicable disease prevention. Tuition is due weekly on the first scheduled day of attendance for the current week. Tuition fees are not subject to pro-ration for illness, holidays, vacations or emergency closure of the center. Your full contracted weekly tuition is due regardless of absences or school closings. Download our Reoccurring Payment Plan Authorization Forms for ACH or Credit Card to easily and automatically pay your tuition. If there are any circumstances that prevent you from paying tuition on a timely basis, please discuss this with the Center Director. An annual non-refundable registration fee of $65.00 must be paid in advance to enroll your child and will be due by the first day of September each year. Part time children are not permitted to switch their scheduled days. If a permanent change needs to be made to your schedule, please see administration so appropriate staffing may be arranged. You may add additional days when needed with prior approval from administration. A late fee of $25.00 will be assessed if tuition is not paid on time. If a personal check is returned due to insufficient funds, a $25.00 fee will be assessed for each returned check. If a child is picked up after closing time, an additional fee of $1.00 per minute will charged. This late fee must be paid at the time of pickup. For each additional child in your immediate family that enrolls full time, you will be entitled to a 10% discount applied to the lowest tuition rate. Please give two weeks written notice if you plan to withdraw your child from Future Scholars for any reason. There will be no refunds on registration or tuition if you withdraw. Future Scholars will make every effort in keeping a healthy environment for your child. Our illness and medication policies are mandated by licensing agencies and are committed to minimize illness through prevention. We ask that parents please help in providing a healthy facility for our children and our teachers. Parents will be contacted first. If unable to reach the parent, the emergency contact(s) will be notified. Pick-up must occur within one hour of initial contact. He/she will be isolated from the group, if possible, and kept comfortable until parents arrive. If a child is sent home sick, he/she much be symptom free and fever free without fever-reducer for 24 hours before returning to the center. In the event that an antibiotic treatment is required, the child must have received the treatment for 24 hours before returning to the center. Children who have contracted an excludable communicable disease may not return to the center without a health care provider's note stating that the child presents no risk to himself or others. These diseases include respiratory, gastrointestinal, and contact illnesses such as Impetigo, Lice, Scabies, and Shingles. If a child is exposed to any excludable communicable disease while at the center, parents will be notified. ﻿All medication must be in the original container. Medication may be administered by designated staff only. Please give all medications to the Center Director who will ensure proper storage and administration. No medication will be dispensed contrary to directions on label without a doctor’s written instructions. An Individual Permission for Medication form must be completed. In keeping with the New Jersey Department of Licensing Requirements, we are required to have in place a policy on expulsion from our center. Unfortunately, there are sometimes reasons we have to expel a child from our program either on a short term or permanent basis. We want you to know that we will do everything possible to work with the family of the child(ren) in order to prevent this policy from being enforced. The child’s parent/guardian will be advised verbally and in writing about the child’s or parent’s behavior warranting an expulsion. An expulsion action is meant to be a period of time so that the parent/guardian may work on the child’s behavior or to come to an agreement with the center. Staff will try to redirect child from negative behavior. Staff will always use positive methods and language while disciplining children. Staff will praise appropriate behaviors. Staff will consistently apply consequences for rules. Child will be given verbal warnings. Child will be given time to regain control. Parent/guardian will be notified verbally. Parent/guardian will be given written copies of disruptive behaviors that might lead to expulsion. The director, classroom staff and parent/guardian will have a conference(s) to discuss how to promote positive behaviors. Recommendation of evaluation by local school district child study team. In the event of an emergency school closing for weather related reasons, please look for our school closing on 6ABC or FOX 29. We will also post closing information to our Facebook page. Did you know that consumer products are constantly recalled for a variety of reasons? A recall demonstrates a company’s commitment to making safe products and taking the necessary steps to ensure the safety of those who use them, and it is especially important to be aware of recalls for products that children use. Visit the US Consumer Product Safety Commission for up-to-date safety recalls. You can also call the US CPSC's hotline for information at (800) 638-2772. Health & Immunization Records.